May was a particularly good month for acceptances. I’ve had three stories accepted, two of which have been published by now, the third is forthcoming at the end of this month. I’m particularly happy about these acceptances because the stories are so diverse. One is a prose poem, one is a historical, and one a YA short story. For those who would like to read them, here’s my historical flash. Thank you so much, Karen. It is a challange to send things, true. Congrats Caroline. Good for you. Congratulations Caroline! I loved both the story and the prose poem. The picture accompanying the prose poem was beautiful. Thanks for sharing. Thanks so much for reading, Vishy. So glad you liked them. It’s beautiful picture. 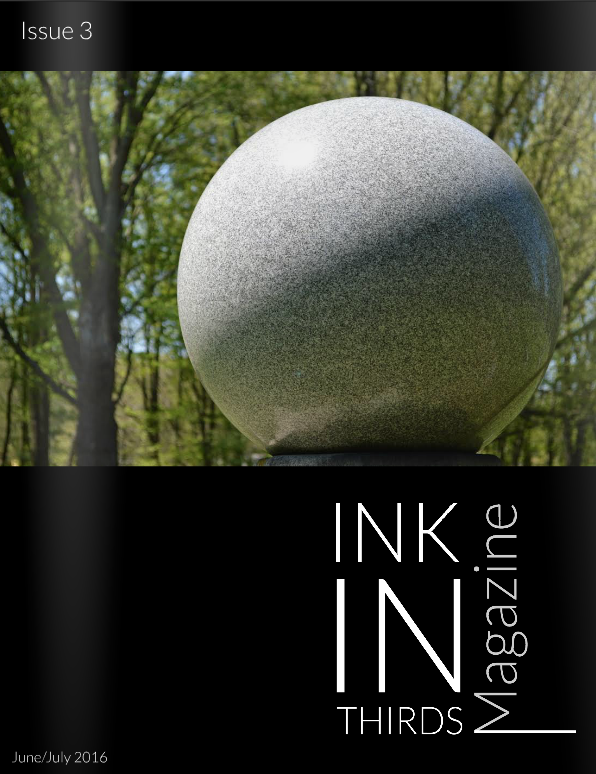 Ink in Thirds is a lovely magazine. I love their photography. Excellent, congrats Caroline. I liked both the pieces, would like to see (or imagine) where they go. Have you read Vertigo by Joanna Walsh? I Keep the First reminds me of some of the pieces in that collection. Thank you so much for reading and your comment, Ian. I don’t know Vertigo. I’ll have look. Thanks. I really like the two poems that you linked. In particular “I Keep the First for Another Day” is fantastic. The situation described seems unusual and a little enigmatic yet realistic. It also flows so well. Thank you so much, Brian. I’m glad you liked them. Especially “I Keep . . .” That is exactly what I was going for. I read them both and they are wonderful, Caroline. Congrats! Thanks so much, Carole. I’m glad you liked them. Marvelous! I enjoyed reading both pieces, especially “The New Girl.” The imagery was terrific. Congratulations! Thank you so much, Jacqui. I’m so glad you liked them. The New Girl is very close to my heart. I was lucky and had another one published yesterday. I was among those chosen for the UK’s National Flash Fiction Day.